The Club is asking the fans to vote of next season’s awayshirt. The page to see the selections is here. Over the last 50 years we have worn change kits in thirteen different colours with a couple of distinctive third strips as well. The majority of those change strips were red although this figure is skewed by a run of red through the sixties and into the seventies. We then went for first amber then tangerine as colours were changed every one or two seasons. The second most popular recent hue is white which is our first option for 2013-14. That first choice is all white shirt with minimal blue piping that will go with royal blueshorts and white socks. 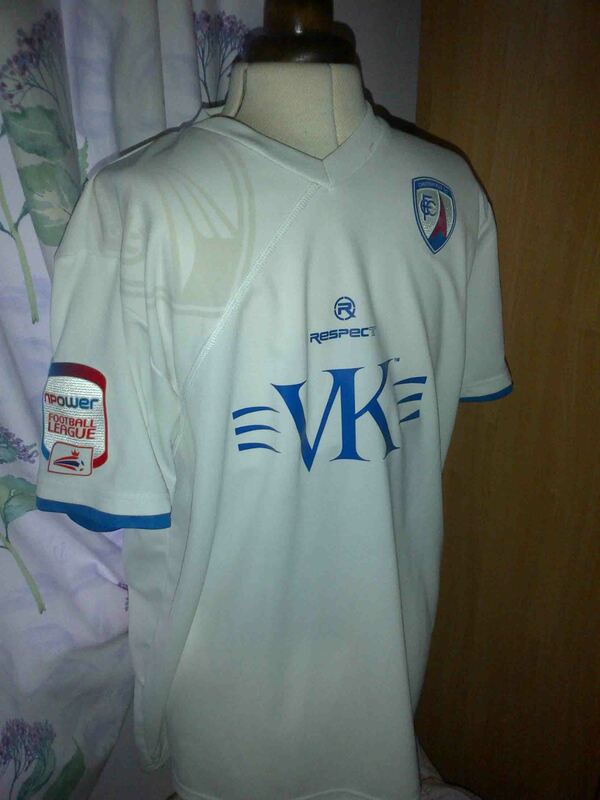 This representsa reverse of our usual home colours and is close to the one worn a couple of seasons ago. The second choice is based on the 1994-96 shirt that was inspired by a fans’ competition. Andy Barker, now our match day cameraman, came up with the design basing it on a nineteenth century home kit that was produced but may not have been worn competitively. The green and white stripes will be paired with similar navy shorts like in the nineties. As well as red, white, amber, tangerine, and the green and white the club has worn away shirts of many other colours in recent years. Yellow or yellow and green, navy, sky blue including one with distorted white stripes, maroon, green and the current gold. 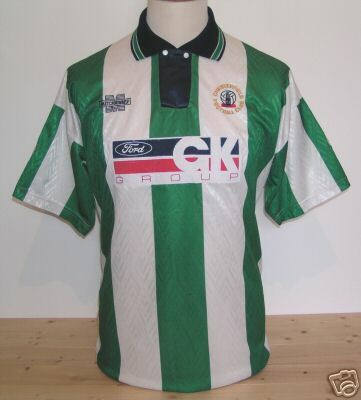 There has also been third shirts of dark green and the infamous and illegal silver one under Darren Brown’s regime. 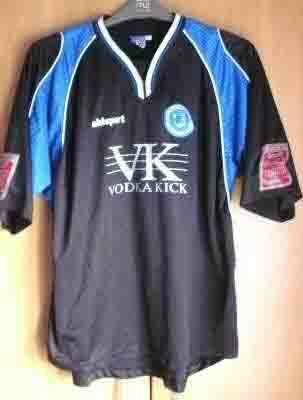 We also had one black shirt in 2003-4. This was with blue shoulder flashes. The third choice for next season is black but with a white “Puma flash” on the shoulder. This will be paired with black shorts. Voting is by email and you have a fortnight to make your choice known. 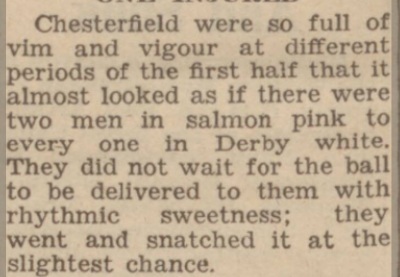 I stumbled across this while looking for something else; it comes from a Derby Daily Telegraph report of our game at The Baseball Ground in 1943. As ever, it was found on the splendid British Newspaper Archive website.